The Honda CBR250 series of bikes were produced between 1986 and 1996. They were a lightweight 4-cylinder, 4-stroke, 6-gear sportbike capable of revving up to 18,500 rpm. The earlier models (1986-1993) produced 45 ps (34 kW), from then on, the power output was reduced to 40 ps (30 kW) in 1994 when Japanese law dictated it. 1986 CBR250FG and CBR250FG-YA (MC14). Twin front disks, single front headlight, bikini fairings. 1987 CBR250R(H) (MC17). Twin disks, still single head light, full fairings. 1988 CBR250R(J) (MC19). Single larger front disk, smaller chain, twin head lights, fuel pump. 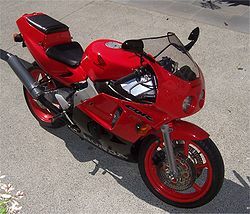 1989 CBR250R(K) (MC19). Essentially identical to the R(J), except now had a speed limiter which was set at 185 km/h. 1990-1991 CBR250RR(L) (MC22). A completely new redesigned bike that features a new cast/pressed aluminium frame that gives a more aggressive riding position, gull shaped swing arm that was adopted from the NSR250, higher rising tail, six spoke cast aluminium wheels and dual front φ276 mm floating disk brakes. The only feature that was adopted from the previous model CBR250s was the original MC14E engine. This too was slightly modified with a crankshaft that featured φ27.5 mm small-end journals, up φ0.5 mm from the previous φ27 mm journals. The engine also uses a completely new set of VP carburettors that feature smaller throats reduced from φ32 mm to φ30.5 mm. These carburettors are now feed by a vacuum operated pump for fuel delivery. 1992-1993 CBR250RR(N) (MC22). Essentially the same as the RR(L) except for new paint jobs. 1994-1996 CBR250RR(R) (MC22). Still very similar to the RR(L/N) but now restricted to producing 40 ps (30 kW). The restrictions are in the cylinder head, head gasket and ignition unit, and all need to be replaced if 45 ps (34 kW) is desired. 1997-1998 CBR250RR(RII) (MC22). These are identical to the RR(R), and are leftover bikes that were built in the 1994 to 1996 era, but sold in 1997 and 1998. Despite Honda claims of the engine revving to 18,500 in the manual, the reality is that the ignition cuts out at around 17,230 rpm, and the ignition map is retarded around the powerful revs (14,000 to 16,000 rpm) to limit the horsepower to Japanese law. These bikes were only ever sold new in Japan, and later the CBR250RR(R) was sold new in Australia. They however can be found in almost any country of the world, and in a number is the most powerful 4-stroke bike a learner is allowed to ride, and hence their popularity. Riding in 6th gear at 100 km/h (60 mph) the engine revs at around 9,000 rpm. Despite the high revs, the bike requires little maintenance, and should easily last 100,000 km with regular oil changes (over 1/2 a billion revolutions!). All four of the major Japanese Motorcycle manufacturers produced a high-revving, 4-cylinder, 4-stroke Motorcycle capable of producing 45 hp (34 kW). They are the Honda CBR250, Kawasaki ZXR250, Suzuki GSX-R250 and the Yamaha FZR250. This page was last edited on 24 November 2010, at 04:35.